For many of the wineries I visit that are small, backyard shed types, these tasks are undertaken by the winemaker who is also likely to be the vigneron so now that vintage is finished the labor intensive task of pruning the soon to be sleeping vines is to be organised. How busy these guys are – and they still have to spend time marketing their wines as well! During my visits to 2 small wineries in the last week, I also noticed and got involved in another very important task by these small wineries. They have been quality grading various barrels of the “same wine”. One of the tings I love about wine is the differences. Every vintage is different, every bottle could be different, every wine region is different and every barrel can be different. I was lucky enough to walk into a small winery when the wine maker was tasting various barrels. He was marking the barrels using chalk with a range from B- to A++. I was able to join in and I found it fascinating – each barrel was different. Different enough that I could understand the ranking strategy. I also found it fascinating the discussion that included comments about how the overall wine would be better for blending components from the different barrels. Another winemaker discussed the same ranking system where his blending strategy was that he blended the A wines together and the B wines were also blended into a second wine. I tasted both final wines from the 2008 vintage and boy are they so different the acid balance and tannin structure are almost 2 ends of the spectrum. Both wines will be very good – at the moment they are both suffering a little from bottle shock and need time to settle down. When released in about 6 months time they will be wines to check again. The 2 wineries indicated above are Petagna Wines and Danshi Rise – wines from these wineries can be found at Taste McLaren Vale’s web site (www.tastemclarenvale.com.au). 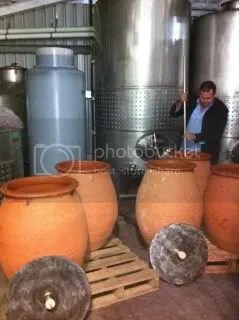 The most unusual winery activity I have seen this vintage has been a winemaker stirring fermenting grapes in a clay pot. Brad from Brash Higgins has a new labour of love – his Nero d’Avola. A new grape variety for McLaren Vale and this vintage is the fist grapes to be processed from the 2008 grafting. If you want more information on this odyssey I will let Brad tell the story – check out his blog entry. Another initiative for McLaren Vale starting May 1st was the unveiling of the McLaren Vale Scarce Earth project – but you will have to wait until my next blog to find out more or check out the McLaren Vale Scarce Earth Web Site for more information in the meantime. This entry was posted in Mclaren Vale, wine and tagged Australia, cellar door, Mclaren Vale, McLaren Vale Wine, Oak (wine), South Australia, wine, wine McLaren Vale, Wine tasting, Winery. Bookmark the permalink.